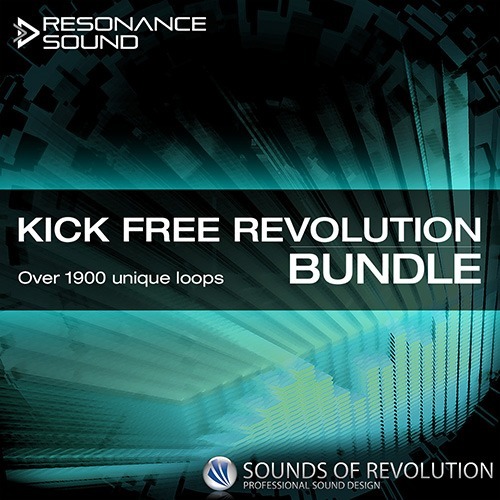 Welcome to the mighty SOR Kick Free Revolution Bundle by Sounds of Revolution distributed by Resonance Sound. Your chance to get over 1900 highly creative and inspiring kick free drum loops suitable for Deep & Tech House, Minimal and Techno for a no-brainer discount of 60% OFF! As a bonus you get >70 kick of the very best, finely honed kicks – all sculpted and maximised to work with the tops. This premium collection is awarded by artists like DJ Tiesto, Adam Beyer, Funkagenda, Jason Nevins, Tom Middleton, Jonathan Grant (Above & Beyond) to name a few, next to amazing reviews from Music Tech Magazine, Computer Music UK, Future Music and many others. You get unique kick-free material painstakingly crafted from scratch and exclusively for this sample treasure chest and does not contain any loveless low-cutted material. This collection of Sounds of Revolution contains one of the tightest, funkiest and most detailed kick free loops available. The SOR Kick Free Revolution Bundle is incredibly versatile and useful. It does not only leave enough space for your own creativity, but will even encourage it! Save 60% to single purchase! The name says it all! If you´re in search for state-of-the-art loops to boost your productions, here´s the place to discover – SOR Kick Free Revolution Vol.1! This library is power-packed with almost 700 unique kick-free material painstakingly crafted from scratch and exclusively for this sample treasure chest and does not contain any loveless low-cutted material. Furthermore the majority of loops, deliberately left without characteristic snares and heavy processing, come as construction kits that build up step by step, which makes “Kick-Free Revolution” highly fashionable for both studio and live work and perfectly suitable for the production of almost any genre of electronic music. This collection, universally produced on 127bpm and divided into categories “Experimental”,”Main” and “Perc Loops”, does not only leave enough space for your own creativity, but will even encourage it! This collection is loaded with 530+ of the tightest, funkiest, most detailed top kick free drum loops for any genre of house. Produced at 127bpm for ultimate ease plus 70 bonus deep, round kicks to fill out the bottom end. Club and layered loops > 140 definitive big-room bangers, full-on club workouts: just add a kick and spin. Clicks, detail and glitch > 100+ minimal-infused toplines, glitched speaker-tweakers and click loops, many with variants for added flexibility. Rough & FX loops > 77 rough, raw, nu-rave inspired bin-drivers featuring bit-crushed beats and dirty musik-cuts. Hat loops > 77 pared-down, stripped hat loops, featuring the best in 8ths, 16ths, straight and swinging pure hat lines. Tonal loops > 52 melodic beatlines featuring toms, claves and more. Percussive and tribal loops > 80+ afro-tribal perc. grooves and deep ensembles – tweaked for maximum sonic integrity. Bonus kick drums > 70 of the very best, finely honed kicks – all sculpted and maximised to work with the tops. There’s not a single doubt producers all over the world have been waiting for this: After the huge success of the Kick Free Series so far, Oliver Schmitt aka Sounds of Revolution listened once more to the needs of the music producers resulting in this fine collection of carefully crafted drum loops. 777 drum loops (!) – fx, hihat, tonal and percussion loops are both inspiring as such and leaving plenty of space for your creativity at the same time. Dedust your conventions, kickstart your signature sound with this fresh groove collection!